She’d never liked beer, Snickers, green peppers or chicken nuggets before. It was only after she received her new heart and lungs that Claire Sylvia took on a slew of characteristics that soon would be her own. Sylvia, 47, was dying from pulmonary hypertension — a disease that increases the body’s blood pressure in the lung vasculature and most often leads to death — in 1988 when she became the first person in New England to have a heart-lung transplant. There is no explanation for how Sylvia took on the characteristics and discovered the identity of Timothy Lamirande, the 18-year-old victim of a motorcycle accident whose heart has been beating in her chest for 20 years. In her book, “A Change of Heart,” she describes how she discovered her unknown donor’s identity through her dreams and sensations. Her teenage daughter described her gait as being very manly. Sylvia also experienced a dramatic change in her level of energy and health. “I used to get sick a lot, and since I’ve gotten Tim’s heart, I rarely get sick,” she said Thursday in a phone interview from her home in Florida, where she moved six years ago from Maine. But how is it possible for someone to take on the traits of an organ donor? And how is it possible to learn the unknown donor’s name through a dream? Transplant patients are never told the names of their donors, for reasons of privacy. But Sylvia somehow had gotten through to the other side. After a second dream nine months later, and the question still burning inside her, Sylvia decided she needed to meet her donor’s family. She contacted the hospital’s transplant coordinator, Gail Eddy, in hopes of getting in touch with them, but to no avail. The transplant program observes a strict code of confidentiality. Even after mentioning Tim L.’s name, Eddy refused to provide the information. “Let it go. You’re opening a can of worms,” she told Sylvia. But a few months later, and with the help of friend who’d said he’d dreamt of Tim L.’s obituary the night they’d met at a local theater, Sylvia got up the nerve to track her donor’s family down. She and her friend found Tim Lamirande’s obituary, including his name and address, in a Boston newspaper. She wrote the Lamirandes, and they agreed to meet with her. All her questions were confirmed as the young man’s parents and siblings attested to Tim’s food tastes and personality traits . Would Sylvia be different today had her donor not been Tim, but a woman? Sylvia says she conducted research for 10 years after the heart and lung transplant and found other organ recipients who experienced the same, if not similar, changes in their personalities. How did she know Tim L. was her donor? Ten years later, in 1998, Sylvia received a kidney transplant from her ballroom dancing partner and ex-boyfriend. She says she experienced a post-surgery phenomenon similar to the first. This time, she gained a fondness for cooking. “I started baking and making things for him that I hadn’t done before,” Sylvia revealed in a phone interview. “He said, ‘You cook just like my mother used to.’ ” His mother would cook for him often. She lives with Parkinson’s disease, has survived breast cancer, has only half a thyroid and a very bad case of shingles for which she recently had surgery. “I’ve survived a lot of different, different things,” she says. She remains in touch with Tim L.’s family. She is close to his mother and they exchange Christmas gifts when she goes to Boston, where his family resides. She plans on flying there on May 23, just six days before the 20th anniversary of Tim’s gift of life to her. “A Change of Heart” has been published in 12 different languages. 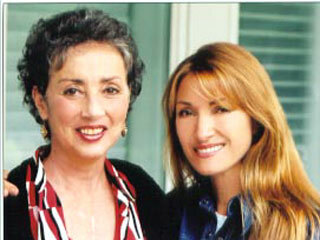 In 2002, the film “Heart of a Stranger,” starring Jane Seymour, was released based on the book. Hi there can I use some of the content from this post if I reference you with a link back to your site? Previous Previous post: Ahmadinejad Says Comments About Gays Were Misunderstood.